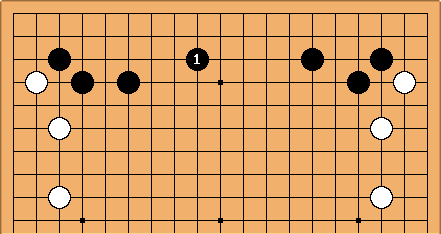 For quite some time here was the normal answer when White approach the 4-4 point. A change of fashion occurred amongst pros, at the start of the 1990s, and the low answer took over. 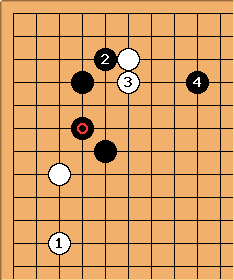 Still, this is a major idea in joseki; and if Black already has a stone at one of the circled points it is natural for Black to claim territory on the fourth line in this way. 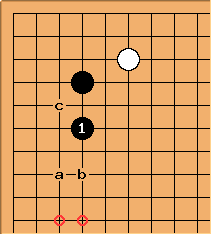 DJ: If I may add a comment, I do not think that, even given a stone at the marked points, claims any territory at all: San-san is open, a and b are feasible invading points, there's a nozoki at c.
White can also tenuki, risking a diagonal attachment. This is the classic continuation. To switch direction, Black can play at a (4-4 point low approach high extension, slide, pincer, or even b (4-4 point low approach high extension, slide, attachment). 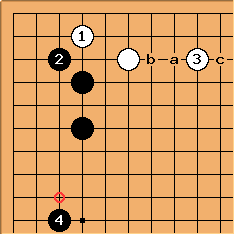 as tenuki is seen; and Black can certainly omit , which is however a big point to make the most of Black's fourth line position. Bob McGuigan: might also be at the circled point if Black wants to play more territorially on the left side. Charles Bob's play is seen in modern pro games in this type of position. If were played one space to the right, it would leave weaknesses on both sides. 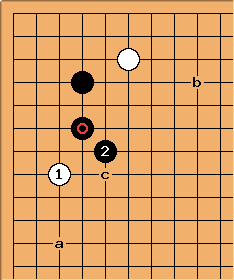 White plays at f to undermine the base of the black stones and hinder black's progression down the side. Andy Pierce: I play the high extension when I am looking to develop primarily towards the center and secondarily along the left side. I'd like opinions on how (and whether) to answer ? 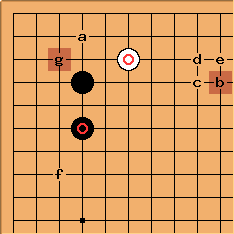 Is here adequate for center emphasis, or are there better options, for example in the context of facing an opposing san ren sei on the bottom side? Charles This would be sometimes enough. 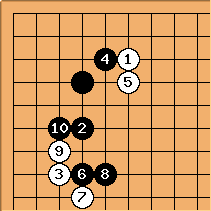 Depending on the top side, playing kosumitsuke there before might be good, to get a double attack?. The books teach Black at a here. 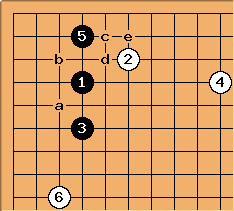 The pros tend to play b.
a and c are joseki (Kogo). 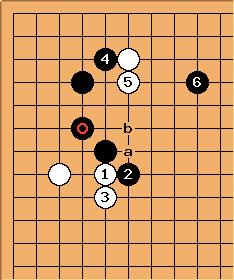 If White cuts at a, Black can play b to attempt capturing the two stones at top. I have seen amateurs play this several times but the corner is not secure and this doesn't seem to fit with the purpose of in the first place. Charles Classic bad play - see clumsy double contact. I have played this way to secure a base but there must be better options here as this is just too slow. Charles Not at all good. at a is better, but this all shows 'handicap game mentality'. Why play the high extension at all, if you are content with this? Andy Pierce: I agree. I think these type of plays arise as a result of both greed and fear. 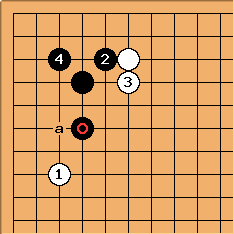 When an amateur plays the high extension, the mindset is often not of developing central power, but of trying to secure more territory than would be secured with a low extension (greed). When white plays the second kakari black's mindset switches from greed to fear (now I don't get a base!) and he makes some panicky overconcentrated athematic gote moves in the corner. Imagist: This seems better to me. atulab: a friend of mine started playing in our games because he read somewhere its worth 20 points. the fact is it gives me a really hard time when he plays it because I can't find flaws in his position anymore when I try to take some territory from him at 6, he can attack it by leaning on and (or cut after making thickness attacking ). 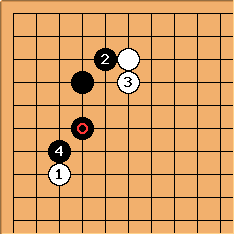 I also can't find a good move in the corner: (I tried a and b with moderate succes: had to sacrifice to live). What would you do against black's corner ?